Last week, I styled a black winter coat 5 ways. 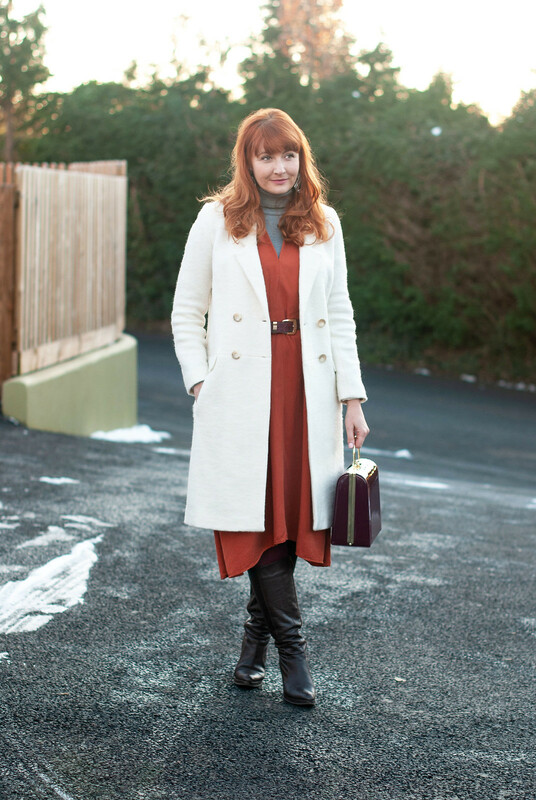 This week, I’ve gone the opposite way and styled a white winter coat. Many people consider it madness to wear a white (or any light coloured) coat due to their apparent dirt-seeking and stain-attracting qualities. However, there are none more clumsy than I, and I am JUST as likely to get things spilt down a white winter coat as any young child is. As an example of my clumsiness, I’m not allowed tall glasses at the dinner table at home or my parents’ house or ANYWHERE because it’s inevitable that I’ll knock them over. I’ll also walk into door frames because I didn’t manage to get through the middle in time (?!). I’ve spilt an endless number of drinks, smoothies and nail polishes (anything liquid, in other words) down myself despite not having a CLUE how I actually managed to do it. So it may seem like I’m the LAST person in the world who should own a white coat (or who should even recommend anyone getting one for that matter! ), but hear me out: white coats have magical powers. 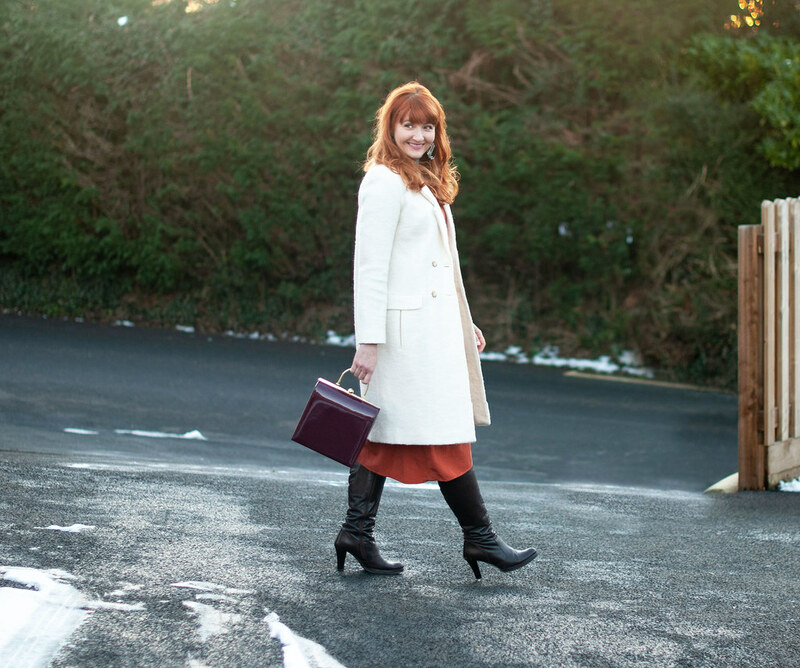 In fact, there are TWO incredibly magical things that a winter white coat can do for you and your wardrobe. Number 1: a white coat makes your outfit look expensive. The reason for that is simple – it gives others the impression that you have TONS of money. If you can wear a white coat, you’re obviously the sort of person who has servants to do all your work for you. Oh, she’s wearing a white coat – she must have a nanny and a butler and a driver because NO WAY does she have grubby kids or need to cook or have to travel on the bus/tube/train! What famous family all wear white and pale colours in abundance? Yep, the Kardashians. Number 2: a white coat automatically repels dirt and stains. WHAAAAAAT, I hear you cry – how can it repel stains? Isn’t it by its very nature able to pick up every little grubby mark imaginable? Well, no – a white coat repels them because you’re SO hung up on the fact that you’re wearing a white coat that you avoid chocolate. And coffee. And wine. And children under 13. And food generally. You could say that a white coat keeps you thin because you avoid restaurants, cafes, schools, parties, etc. ALTOGETHER because, you know – there may be food there (the horror)!! My magic winter white coat this week was brought to you by the power of big hair (fresh out the salon), big earrings (which add a little pizazzy pattern, scroll down for alternatives), yet more burnt orange in the way of this lush midi dress from Mango (though a total bugger to iron, grrr), and my very old, but still-fabulous brown knee-high boots from Duo. 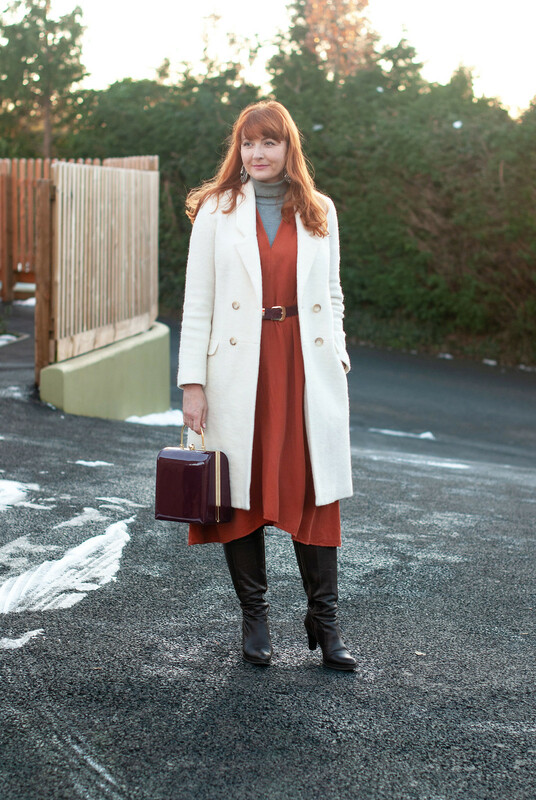 With a grey roll neck for some layering warmth and a bit of leftover snow on the ground from last week’s miniature snowmaggedon, I somehow managed to keep warm, stain-free and injury-free last weekend when wearing this outfit. 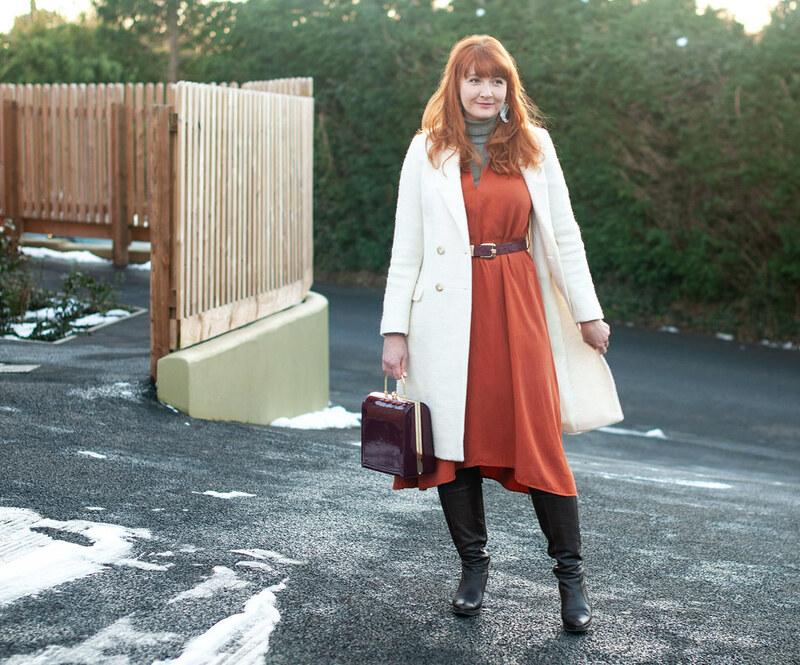 I’ve had the dress AGES and I’m so glad it’s made an appearance on the blog at last. And just a note about the white coat: I bought this one after I ruined my previous white coat when dunking the whole right sleeve in hot chocolate (that I’d spilt WITHOUT noticing) a couple of years ago. Didn’t see the spillage, didn’t notice the dunking. The stain was there for days before I realised I had one hot chocolate-coloured sleeve, and by that point it was permanent… the stain never came out. Do add your outfits to this week’s link up – and if you’ve added a link to here or my button to your post you may be featured in my bimonthly Women Who Wear What They Like post! Oh, I’ve always loved white/cream coats. I don’t think I’ve had one since I was 8 and had a white rabbit fur coat with matching muff (GAH), but I did go through a white sweater phase, and like you said, they’re MAGICAL in that they keep you on your toes about what food, drink, people, elements you let near you. 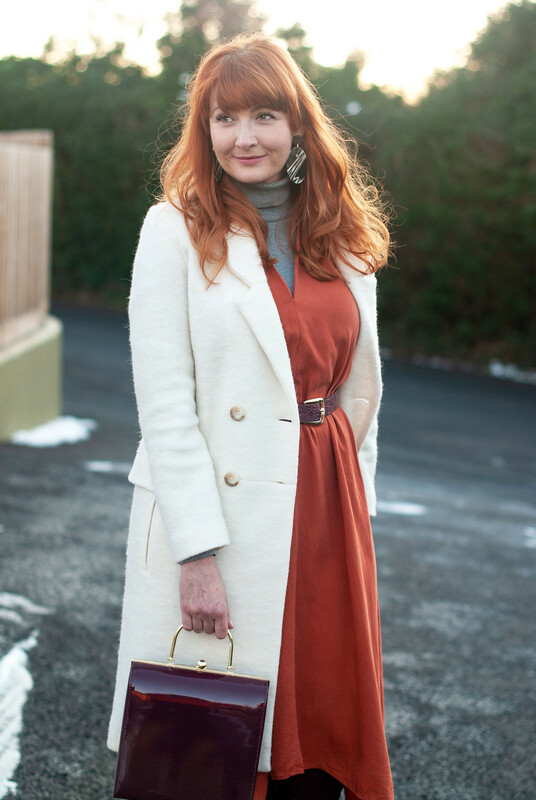 I love how you’ve styled it with that rust dress and those gorgeous boots! I’ve never considered a winter white coat, but I do have a pair of winter white pants and a winter white faux fur vest. Both pieces I almost did not buy, well because they were winter white. I do agree with all 3 of your points – especially about the one about making your outfit look expensive. It’s so true! Its also a nice way to switch up wearing black. And I’ll add, to my surprise, I have yet to get a stain on my winter white trousers – I know, shocking! Super fun post, loved it! Love -Love- Love – a beautiful white coat. They are supremely classic and a sign of confidence even with our little mishaps. I’ve had several that after wearing for several years had to give up because I wore them out. Mine are not pure white but a beautiful cream, not too yellow and certainly not a stark white. A nice, soft, creamy white. Fabric choice is important. Polyester does not clean well but add a little nylon, they do much better. Enjoy and many thanks for your inspiring words! Such a humorous post. I love how you said white coats repel stains. Your coat is gorgeous! I love wearing white. I love the bright coat with deeper colours underneath. You’re right; it does look rich. I bought a white light-down jacket from Uniqlo just before Christmas, and it has totally brightened up my winter. I’ve been wearing it with charcoal grey or navy turtleneck sweaters and it feels so much cheerier to put on something bright. I also am a master of the stealthy spill, always getting something on myself, and never knowing how I’ve done it, but so far so good with this jacket! Catherine, I adore your white coat and that lovely dress! 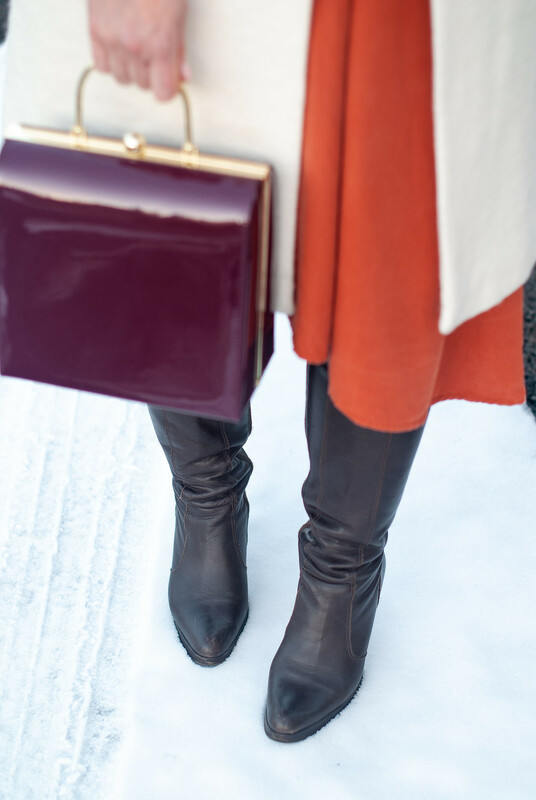 My winter white coat is one of my favorites because it really does look fancy and expensive. My theory on wearing white is this…we get so worried that we will spill on it that in our excessive care about it I think we make ourselves clumsier. If we wear pastels which are just as likely to pick up dirt and stains, we don’t worry nearly as much as we do when we wear white and so we go about our days like normal and don’t spill. So when I wear white, I take a deep breath and forget about it. I am much less likely to spill on myself when I put it out of my head completely. It seems to work! It’ sort of like if you have a broken toe, you are so focused on it all the time that you continue to bump it into things more often than when it is not broken. So put on your favorite white things and forget about it! Two words make this colour a non starter for me ‘Pepe’ and ‘Murphy’ my bouncy bouncy Shihtzus! My poor first white coat went to the dry cleaners, Jill but it was beyond saving 🙁 – I sure learned my lesson!! No more hot chocolate drinks for me…! Love your tongue-in-cheek advice about wearing the white coat! But I do agree, famous people wear them and they do make your outfit look expensive!! Of course, the way you styled the whole outfit is what made it work. You look amazing in rust and orange with your hair!! Thanks for sponsoring the link up–and two times per week is a lot of work, I’m sure! Thank you so much Darlene – I do love the white with my hair too…!! I love a Winter white coat for all the reasons you mentioned . You wear it beautifully. That ladylike bag is just perfect.Many thanks for the Link Up Catherine. Aww Jill thanks – I’m always forgetting about the bag but it’s pretty roomy and so smart! Thank you Laurie – if *I* can keep a white coat clean [so far], then anyone can…! I wore a winter white sweater out to drinks with my girlfriends last weekend and you can guess what happened: red wine spilled all down the front. Luckily, there are some miracle products out there, and it all came out. Long story short: don’t worry about spilling, especially when you look so fab in white! OMG thank goodness it came out, Cheryl!! Someone spilt red wine all over our stone-coloured suede sofa once but thanks to the Scotchguard it all came out too… red wine is the devil’s drink, lol!! Love winter white – looks spectacular from head to toe! I totally agree: A white coat just looks posh and in the winter dark coats get those salt marks all over them and are just as likely to look dirty as a white coat. That’s a good point, Julie!! 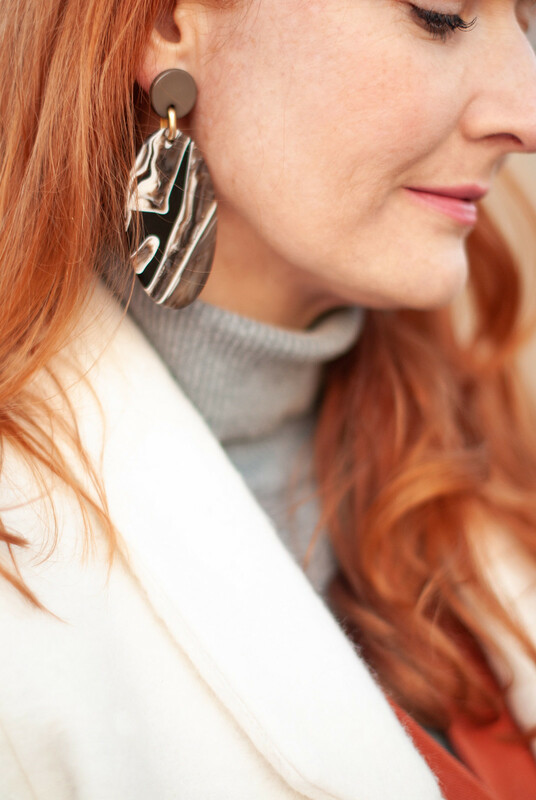 I’m a total sucker for winter white! Beautiful coat! But that bag…….! 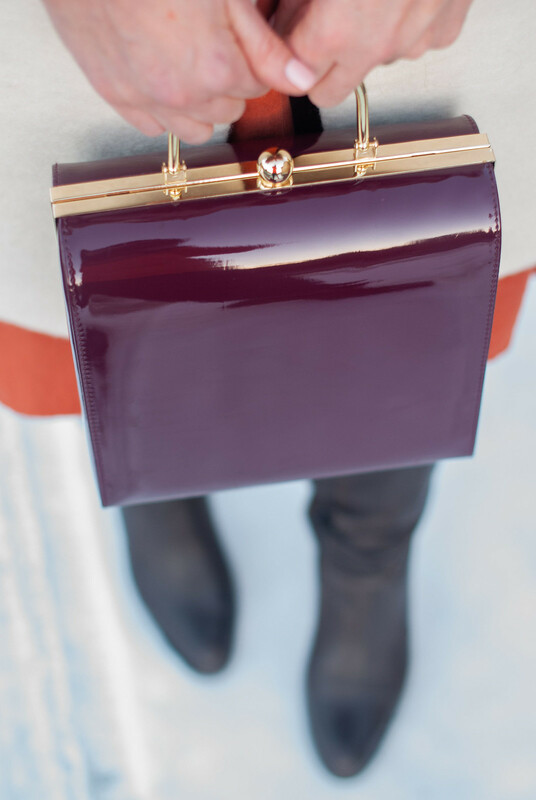 I am SO loving all of the structured, lady-like handbags! Thank you lovely Melissa – yes I’d love to get a collection of those box frame bags in every colour imaginable…!! Aww thanks so much Jacqui! The fringe is staying even if the length isn’t…!! I’m totally on the hunt for another white winter coat. I bought one about 12 years ago and wore the heck out of it. Sure, it did get some dirt on it, but I bought a machine washable one. And it lasted 10 years….it was definitely worth it. And your rationale of it being stain resistant?? Hilarious. You ought to be a lawyer….LOL!! I think that bag is fantastic! So 50sh! Just so elegant. I love winter white, it’s so classic and elegant. 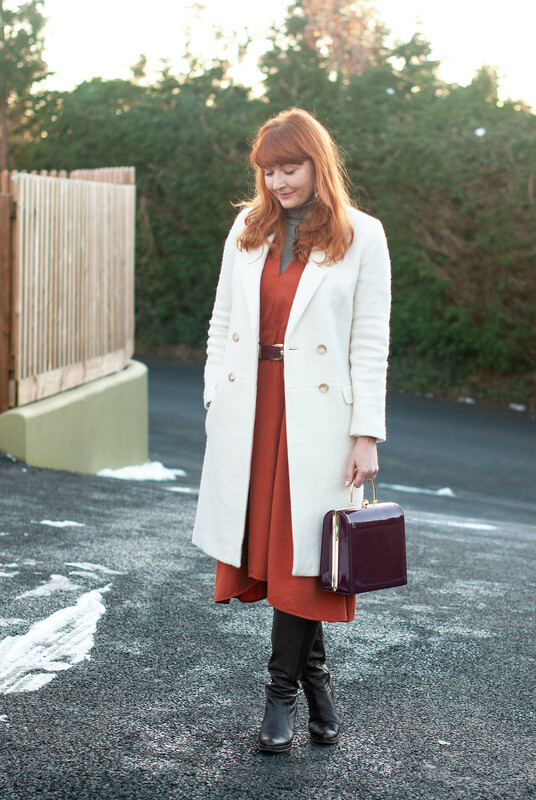 Beautiful coat and styled lovely!